Dimensions 6.50 by 6.50 by 9.25 in. 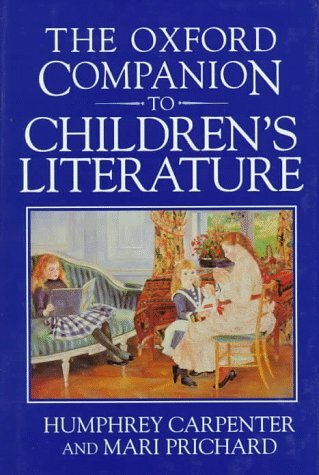 Amazon.com description: Product Description: Now in new covers, The Oxford Companion to Children's Literature brings together all aspects of this appealing and wide-ranging subject. It's 2,000 entries range from the early romances and legends enjoyed by children (although not composed for them) to cartoons, fairy stories, comic strips, radio, and television. It includes works from Britain, the US, Canada, Australia, and New Zealand, as well as works translated into English. The plots of major works are summarized, and full and fascinating details are included about authors, illustrators, fictional characters, genres, and important aspects of children's play and learning. Remember...* Thomas the Tank Engine *The Eagle *Emil and the Detectives * William * The Would-be-Goods * Charlie and the Chocalate Factory * The Secret Garden This book is intended for parents, teachers, librarians; general readers with nostalgic interest in the literature of childhood; anyone concerned with children's educational and imaginative development.